Many feiseanna offer competitions for adults. Here's a quick glance at the adult-friendly feiseanna in September. Plan on supporting a feis in your area that includes adult Irish dancers. We adults can dance with the best of them, but we also know that taking good care of our bodies will go a long way to keeping us healthy and on our feet. Foot stretches can strengthen your dancing and save your feet from injury. While warming up, treat your feet to a massage and reap the benefits. 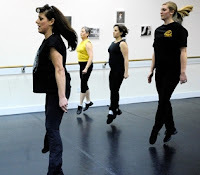 · Preparation for impact-by warming up you protect muscles in your feet, legs and back when you land those leaps. · Prevent injury-keeping those foot muscles pliable decreases the chance of fall and injury. · Relaxation and rejuvenation-release stress and recuperate by massaging foot muscles. · Increased energy-muscle massage stimulates and energizes. · Pinch a toe between your thumb and first two fingers. Gently roll the toe back and forth as your fingers and thumb slide to the end of the toe. Repeat with each toe. · Grasp the upper portion of your foot, placing your thumb over the pad. Massage the pad of your foot directly underneath the toes in a circular motion. · Hold the outer part of your foot with the opposite hand (right hand to left foot, etc). Press the end of your thumb into the muscle of the outer part of your foot, continuing in a line down the length of the foot. · Grip your foot with both hands, placing both thumbs on the underneath part of the heel. Massage the heel in a circular motion with both thumbs.